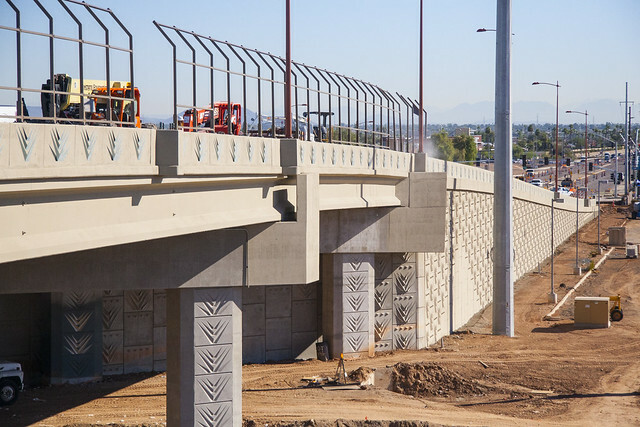 If you think the photos above suggest that the overpass under construction at Bell Road and Grand Avenue (US 60) is just about ready for traffic, you're right. Barring an unforeseen event such as extreme weather, we're planning to reopen Bell Road across Grand Avenue on Tuesday, Nov. 22, in time for the start of the holiday shopping season. The slideshow above shows a Bell Road bridge lacking only final touches. Crews are pouring concrete to form the base for asphalt pavement and completing the bridge fence, among other work. While ADOT has maintained access to area businesses through a convenient detour route, reopening Bell Road as scheduled is a big step forward for this project and for Surprise. After the Bell Road bridge opens, the final phase of work will include completing ramps to and from Grand Avenue and completing new eastbound lanes of Grand Avenue. That's scheduled to be done before the start of baseball spring training. A full closure of Bell Road is allowing crews to complete this $41.9 million project faster and without affecting spring training or the holiday shopping season. With the end in sight, West Valley motorists are set to begin reaping the rewards from having a modern traffic interchange in the heart of fast-growing Surprise.